In a pre-recorded, 10-minute televised address, President Dilma Rousseff of Brazil sought to calm the nerves of a nation on the boil, promising US $1 billion from the National Bank for Economic and Social Development (BNDES) to improve the urban transit system, 100 per cent oil royalties for education, import of doctors and, importantly, a new federal investigator for cases of political corruption. The grandmotherly address to a petulant and protesting nation of 194 million offered too little and came a whit late, after nearly a fortnight&’s nationwide protests and a march on 20 June in over 80 cities across the length and breadth of the country ~ from Sao Paulo and Rio de Janeiro to Recife, Belo Horizonte and Salvador de Bahia. As a protestor put it succinctly, it is more than the increase from 10 to 20 cents in transport fares that brought hundreds of thousands of largely peaceful protestors on the streets. According to the research institute, Datafolha, 71 per cent of the protestors are first-timers and in the age group of 26-35 years. There was no political platform; the protestors, in fact, booed party flags and union uniforms. No one targeted individual politicians; the popular rating of Dilma Rousseff remains high at 74 per cent. 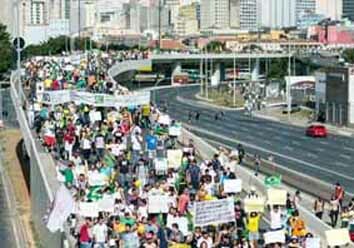 Polls suggest three-fourth of Brazilians support the demonstrations. In the initial days particularly, the protests looked more like fiestas, in a somewhat carnival-like spirit as if to regain the equilibrium of the nation. A range of grievances and emotions, from the demand for free fare (passe livre) to gay rights, brought the protestors together. They are all disgusted with the way the government functions. Dilma Rousseff, the Marxist guerrilla of the 1970s who suffered torture and imprisonment for three years under military rule, recalled the struggles of her generation in an attempt to identity herself with the mood in the streets. Twitter went viral with “Shut-up Dilma” after the presidential address. The spontaneity of the protests marks an awakening of Brazil; Dilma&’s aides admit that they have no idea of what is happening. Brazil entered the “super cycle” of commodity export boom in 2003 on the back of sustained demand for resources by China and other dynamic economies in Asia Pacific. More diversified and industrialised, Brazil also sought to value-add its manufacturing sector for the domestic market and export. but without much success. Foreign direct investment (FDI) in resource sectors rose on a yearly basis, inflation remained under control and the national currency reais appreciated. Brazil became the sixth largest economy with a gross national product of $ 2.48 trillion in 2012; and many of its politicians felt that the country may have left “underdevelopment” behind. The emerging power status was more evident in external relations. Brazil moved out of American hegemony and established closer economic relationship with Asia Pacific. It claimed regional leadership by participating in the peace-building process in Haiti, mediating disputes between Equador and Colombia, economic regionalism through the Customs union of Mercosur and political and security cooperation through UNASUR. It championed South-South cooperation through the trilateral IBSA Dialogue Forum and multi-polarity through the geo-politically significant BRICS summit. It has adopted an autonomous position on Iran&’s nuclear programme. Many fear the end of the feel-good era. Under the resource-export model of production, employment, wages and productivity in the manufacturing, agriculture and other productive sectors have declined. Symptomatic of the “Dutch disease’, export concentration in iron ore, crude, soy etc. hardened the Reais making other exports, manufactures in particular, uncompetitive. Cheaper imports of consumer goods had a feel-good effect. Last year the economy grew less than one per cent manly because exports to China declined. Growth had allowed Brazilians to put up with high taxes; 36 per cent of the GDP goes to taxes. Now, a falling Reais and a 6.5 per cent inflation rate are hurting the earnings and employment of the vulnerable groups. Brazil has not succeeded in boosting its manufacturing sector. It signed a $30 billion annual currency swap agreement with China at the BRICS summit in Durban last March so as to boost export of manufactures to that country. BNDES has disbursed billions of dollars of tax-payers’ money as “stimulus package” and cheap credit to make firms go global. It holds huge assets with potential deterioration and has low capital ratios. Four times bigger, yet it has a large loan portfolio from the World Bank. The states have been at loggerheads with the federal government over oil royalties from fields in Santos basins. Petrobras works on a production-sharing basis and is legislated to hold majority stakes in oil exploration and production. Royalties for education shall constrain its investment in E&P and dampen the interest of foreign oil firms. Protestors know that promised expenditure will not come easy; and they cannot pay any further. The 10-year commodity boom has spawned a huge middle class in Latin America. But who is this ‘new middle class’? According to a World Bank study, Latin American middle class had stood at 152 million in 2010 ~ the same size as the ‘poor’. Another study by OECD in the same year estimated the size of the middle class at 275 million ~ a little less than half of the region&’s population. The OECD study declares 55 to 60 per cent of the population in Brazil as middle class. Catalysts for its rise include sustained economic growth, fall in unemployment rates and declining income inequality ~ factors which have also contributed to poverty reduction. Conditional cash transfer schemes, like bolsa de familia, have helped reduce poverty but not the growth of the middle class. The World Bank study, which culled the numbers from region-wide household surveys, cautions that the new middle class is ‘fragile’. For a household to have no more than 10 per cent chance of falling back into poverty over a five-year period requires an income of at least $10 per person per day. It is also “vulnerable” to economic slowdown, rise in inflation and the tenuousness of enterprise or salary. The new middle class is entrepreneurial; and roughly half of it, as per OECD definition, is in the informal sector. It lacks access to regular employment, social security, education, investment, private sector banking and marketing etc. Brazil&’s new middle class is in fact lower middle class. One may call it ‘new proletariat’. One can question the methodology in the two studies: the World Bank study uses the economic criterion of per person daily income of $4 to 10 ( at purchasing power parity exchange rate) to classify someone as middle, excluding variables like employment guarantee, education and property rights. The OECD counts all those whose income is between 50 per cent and 150 per cent of the national median, ignoring the fact that median income varies across countries and a regional picture therefore could be misleading. It is not the ‘rising expectations’ but the prospect of reverting back into poverty that is agitating urban Brazil. No one is calling for regime change; everyone is demanding change in government&’s priorities. Politicians in Brazil are among the highest paid and its citizens highest taxed in the world. The return on high taxes is very low while costly trades-off is the norm among the political class. Nearly all claim to be ‘socialist’ and ‘democratic’; in reality, most parties remain political vehicles of regional interests and powerful politicians. This is how President Lula got embroiled in ‘cash-for-vote’ to get bills through the national congress in 2005. In the Fifties, Janio Quadros had chosen the ‘broom’ as his election symbol, promising to sweep corruption out of Brazil. Fifth-eight years later, the constitutional amendment, PEC 37, proposes to restrict federal investigation into corruption within the legislature. A 10 cent increase in city fares is outrageous when compared to the $26-30 billion expenditure on the Confederations Cup, the World Cup next year and the 2016 Rio Olympics.The ‘cleaning out’ of slums in Rio that stand in the way of a rising Brazil has degraded humanity who lived there. Brazilians are resorting to civic action. The ruling Workers Party (PT) was formed in 1980 with the support of civil society; its participation has helped PT win three presidencies. Brazil has hosted seven of the last 13 World Social Forums. Presidential platitudes are not enough to satisfy young Brazilians brought up on the culture of civic action. Dilma Rousseff has to sustain economic growth to keep the middle class from sliding into poverty; spend on education and healthcare; enhance productivity; and improve tax collection especially from the wealthy. The middle class might subscribe to democracy but distrusts anything ‘government’. It is not the one to demand inclusiveness; it is for the government to expand avenues of participation and facilitate access to banking and marketing for the very confident-looking urban middle strata. For now, Dilma is talking and taking control as protests ebb. Grievances are deep and need a political answer. If not addressed, tropics are known to get storms, not springs.